Chip returns to The Hilltop nearly forty years after graduating in a new role: parent. He shares the lessons he's learned, campus observations from a new perspective, and his favorite KUA memory. Coming to KUA really taught me how to learn and enjoy learning for the first time. I really got turned on to English and reading while here and interpreting the deeper meaning of the story. I competed here in football, skiing, and lacrosse. At the time, lacrosse was a young sport and I started playing at summer camp. I was taught by someone who used to play at Hobart and William Smith Colleges and he brought the game to the camp. It really took off when I got KUA. We spent a lot of time standing right outside of DR tossing the lacrosse ball back and forth. Playing three sports was great for me and the community was wonderful. We had a ton of fun skiing at Whaleback and ski jumping with Fei (Georg Feichtinger H '02). One day there was a dare to all the alpine guys to go up to the old ski hill and try out the jump and we became addicted to it. It was a blast. The only thing they couldn’t turn us onto was cross-country skiing. 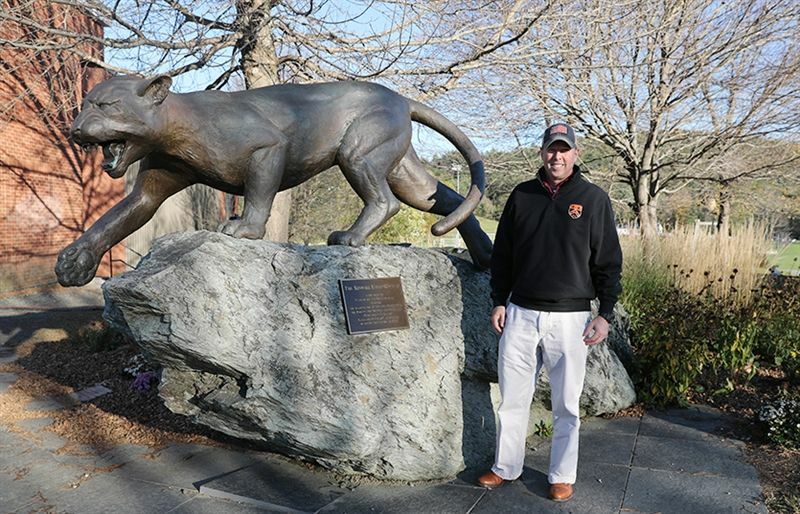 I was inducted this year into the Hall of Fame for both skiing and lacrosse at Norwich University, where I graduated in 1983. I made the All-East Ski team in 1983 and qualified for the Division 1 Ski Championships, where I skied against many of the top racers in the US. I was captain of the ski team at Norwich. I had the chance to compete in the Military World Championships against the best in the world. Alberto Tombo was there, some of the top racers in the world. It was a lot of fun. What experiences did you take from your time as a Cadet at Norwich? I was a traditional guardsman soldier and I still am today. I was deployed to Afghanistan in 2003 as an embedded trainer for the Afgan National Army. I was a team leader for a group. We lived together, ate and fought alongside each other. It gave me a unique insight to that area of the world. How did your daughter, Casey, end up on The Hilltop? Much like when I arrived at KUA, she enjoys going to class and enjoys learning. From what you have heard from Casey, how is KUA different now than when you were a student? The difference is the infrastructure – the buildings, the fields, the layout. I looked for both of my rooms and neither one of them are there! They have both been converted to faculty housing. The bathrooms are the same though. In general, the dorms are similar but the classrooms have so much more. I think it’s great that the cell signal is not great here because the kids unplug a little. That’s a unique piece to this place that is working in its favor today. Another great thing is that I’ve reconnected with my KUA friends because Casey is here now too. It’s really great. I look at Casey and can see all the friendships she is forming now that will last her for the rest of her life. And they are all good kids. Looking back on my time at KUA, believe it or not, I really cherish those formal dinners. Nowadays, as a society, we are so rushed – there’s no time now to sit down and have a meal, together as families.